Blockchain ledger technology is disrupting many industries and businesses, and the legal profession might be next. The blockchain ledger system is on course to upend and change the way the legal industry operates. A blockchain is a type of distributed ledger of anything that can be recorded, from financial transactions and ownership of physical assets, to contracts and private data. Its key characteristic is the employment of a data structure where transactions are organised and bundled into a block. Every block is “chained” together with a previous block using a cryptographic hash function. Only users can edit the part of the blockchain ledger they ‘own’, and can only gain access to a file because they have a private key to do so. 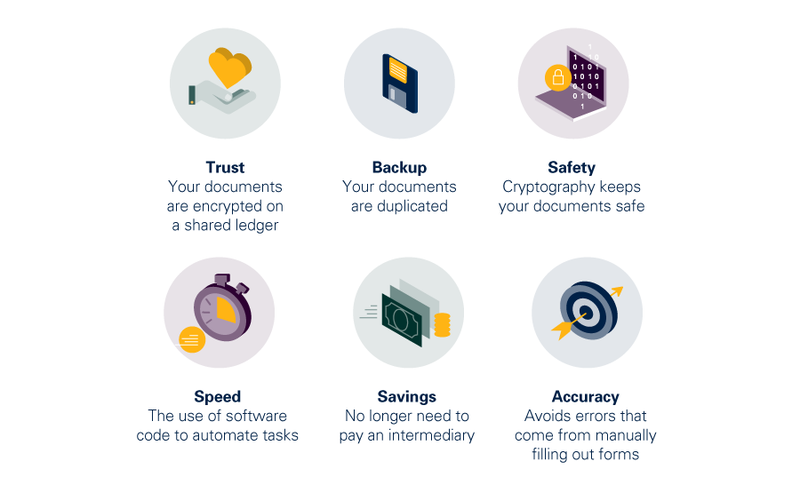 Blockchain also ensures everyone’s copy of the distributed document is kept in sync. Essentially, blockchain technology is similar to a shared database. It’s deployed in use cases and applications where participants do not necessarily trust each other, or where participants prefer to reduce their reliance on third-party and intermediary service providers1. A smart contract is a self-executing software program that automatically performs some sort of function. For example: making payment when the contract is triggered by an event1. Smart contracts permit trusted transactions and agreements to be carried out among anonymous parties without the need for a central authority, legal system, or external enforcement5. In 1994, American Computer Scientist Nick Szabo, proposed the idea of smart contracts. Szabo defined them as computerised transaction protocols that execute terms of a contract, in order to extend the functionality of electronic transaction methods such as POS, to the digital world5. Why use a smart contract? An ICO is a fundraiser, using cryptocurrencies, that leverages the blockchain ledger system to store who contributed, when they did, and how much they donated. Typically, a company will raise funds via their website in a crowdfunding manner, producing a whitepaper outlining the business and how they plan to implement the funds garnered. ICOs are a tremendous opportunity for law firms, in-house counsel and government agencies. Law firms are providing counsel in this new area, considered confusing for all parties involved. These firms will focus on federal and state money service laws, privacy and security, intellectual property and money laundering. There is also the chance ICOs can go sour. There has been an increase in potential phantom companies who are trying to leverage ICOs to defraud people out of their money. Therefore there is huge potential in ICOs for the legal industry, as there will possibly be a call for regulation on an international scale8. In 2017, PwC conducted a survey, and consequently, a study on law firms. The following data was compiled. 70% of law firms surveyed will use smart contracts for transactional legal services. 41% will use blockchain solutions for transactional legal services, 31% for high value legal service, and 21% for business support. A top priority throughout the firms is to improve their use of technology within their service. Main drivers for the use of digital and emerging technologies is to improve the client experience and to streamline operational efficiencies9. A primary feature of the smart contract is it can be edited and customised by a layman, limiting the need for an intermediary such as a lawyer or an accountant. Thus, if smart contracts do achieve mass use, the demand for legal services may decline7. Alternatively, blockchain technology and smart contracts could have a profound positive impact on the legal industry. Fields of work disrupted by blockchain technologies will need specialised law teams to resolve regulatory and operational challenges arising from the new technology. Organisations planning to use blockchain will need counsel in order to design a proper legal structure consistent with existing regulatory structures10. Soon it will be possible for firms to integrate blockchain technology within their practices. OpenLaw, a blockchain-based protocol for the creation and execution of legal agreements, is the first project to enable the creation of smart legal agreements. Using OpenLaw, lawyers can efficiently engage in transactional work and digitally sign and store legal agreements in a secure manner – leveraging blockchain-based smart contracts. OpenLaw aims to reimagine the creation, execution, and storage of legal agreements. Lawyers and organisations will be able to automatically create and manage the execution of legal documents, as well as embed Ethereum-based smart contracts into legal agreements, which can decrease ambiguity. How can blockchain be used in the legal industry? Clients in different industries will be attempting to navigate the realities and disruptions blockchain has brought into their workplaces – in terms of blockchain law, blockchain regulation and policies. Law firms who position themselves as blockchain experts will be required for guidance and support11. A public blockchain ledger can be created of who owns which land deed. All parties involved (from governments to land owners) can see and access the information to see who owns what, and on what dates ownership changed hands11. Blockchain ledgers can provide a record of filing for intellectual property rights that could be accessed on an international scale. The irreversible factor of blockchain, partnered with it being secure and time-stamped, offers a prime way to provide evidence of first use, and applications for patents, copyrights and trademarks11. Historically, government data such as birth/death records, marital status, business licenses etc. are difficult and time-consuming to access, or – in cases of loss or damage – replace. Blockchain could solve these governmental stagnations by maintaining and securing public-data records11. According to the Official 2017 Annual Cybercrime Report from Cybersecurity Ventures, published in October, cybercrime will cost the world $6 trillion annually by 2021. The introduction of blockchain identification mechanisms for security problems could be a solution. The use of self-sovereign ID – a form of identification that is unalterable and almost completely secure – may change the way individuals use and access their identities and sensitive data online. The self-sovereign ID is a digital identification, that you could present online, without passwords or other verification to certify your ID. This ID can also collect small bits of user’s ID that can be found online such as social security information, medical records, social media credentials – and use a key that is stored on blockchain’s ledger. The above would not only simplify legal processes and requirements (for example: requiring a birth certificate to apply for a lost passport, or having to present legal forms of identification when entering into contracts), but would help protect our identities from those who would seek to steal them, or the sensitive information they protect. These are but a small handful of the legal applications and implications of blockchain technology, smart contracts and blockchain regulation. As blockchain regulation and technology matures, we will continue to see it impact and disrupt a plethora of different industries, organisations and careers – including the legal profession. It’s important to understand how blockchain works, the ecosystem it lives within, blockchain regulations and how to incorporate it into your field. The Saïd Business School, University of Oxford Blockchain Strategy Programme is designed specifically for business leaders and innovators, focusing on the impact of blockchain and how it can affect or be incorporated into business strategies. In addition to increased knowledge, expert insights and a global network of business leaders, participants walk away with the Oxford Blockchain Strategy framework and the Oxford Blockchain Regulation framework – developed exclusively for the programme and its participants. These frameworks can be applied to any blockchain use case or concept. In the blockchain era, don’t let your organisation get left behind. Study online with Oxford University’s Saïd Business School.